DMV.com was created to help simplify your life by providing you with all the vehicle related information and Wyoming DMV services you may need, in one place. Quickly find information and services regarding driving records, vehicle registration, drivers license renewal, license plate renewal, getting a learners permit, and finding a Wyoming Department of Motor Vehicles approved traffic school. Get a Wyoming drivers license from the WY DOT in a few simple steps. A DOT drivers license is required for residents to drive in the state. Requesting your WY driving records online lets you avoid the long lines at the DMV. Order a Wyoming driving record from the comfort of home. Car insurance is required for drivers in Wyoming. Get affordable car insurance quotes from our WY online car insurance center today. Wyoming traffic school may allow drivers to obtain insurance discounts and benefits from the DMV. Learn about online traffic school in WY. Taking a WY driver practice test helps you earn a license. Complete a DMV practice exam online to prepare for the Wyoming license test. Car registration is required for car owners in Wyoming. Find out how to get car registration documents from the WY DOT in a few easy steps. The WY DOT allows some minors to take approved drivers education courses before applying for a license. Learn the benefits of WY drivers ed. A DOT bill of sale records the transfer of a car title. Learn how a bill of sale from the WY DOT can benefit car sellers and car buyers. Learn how to pay a ticket online in Wyoming quickly today. Paying driving fines by the deadline ensures that drivers avoid DMV penalties. Learn about Wyoming DUI laws and the DUI consequences imposed by the WY DOT. Getting a DUI in Wyoming is a serious offense. Before you buy a car in Wyoming, consult our helpful resources. Learn how buying a car online can simplify your WY DOT registration process. You may need to visit a WY DMV office to obtain some services. 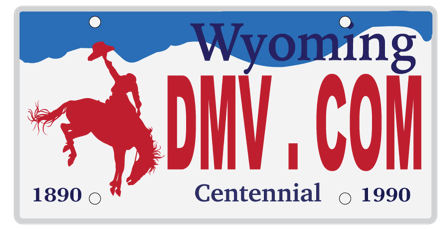 Find convenient DMV locations in Wyoming, and get DMV contact information. Cut out DOT’s bureaucracy. DMV.com has easy guides for drivers license, vehicle registration, license plate, emissions and other motor vehicle issues online. DMV.com is your best online guide to the Wyoming Department of Transportation. We provide you with info about every single matter related to the WY DMV quickly and easily. Our wide array of articles on the different requirements that WY DMV has about each type of vehicle is here to make things clear for you without forcing you to stand in line at the local DMV office. Searching for information at our website is very simple – you can easily find the list of articles about WY DMV by using the navigation section or the “search” feature. With just one click, you are able to find out everything you need about getting a vehicle registration, obtaining or renewing a driver’s license and much more.